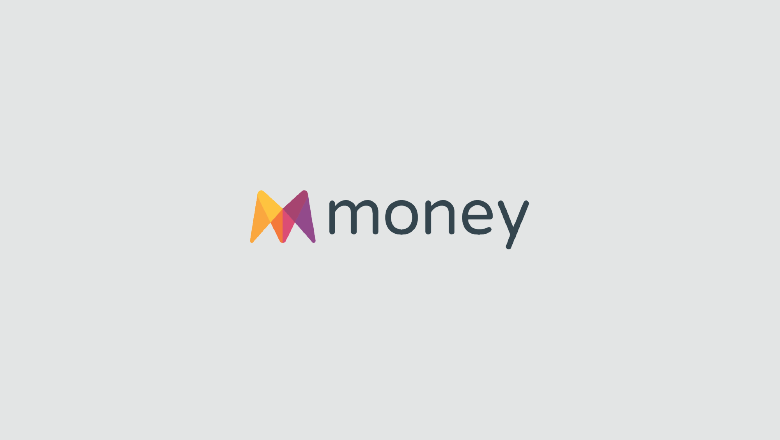 Money.co.uk is a free, online comparison service that helps people throughout the United Kingdom discover and compare thousands of financial products every day, from bank loans to credit cards. And while making informed financial decisions is clearly important, it’s not typically the type of subject matter that lends itself to viral success. So how does a company specializing in free, online comparison tools for financial products build brand awareness and engage social media audiences? By employing smart strategy supported by Sprout Social. 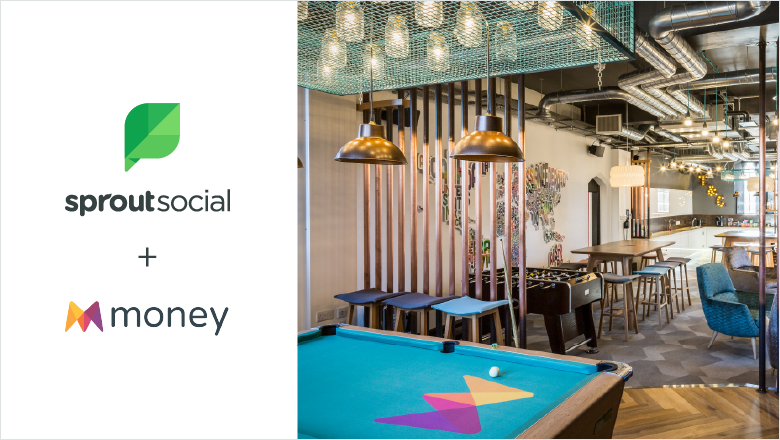 Over the course of a single year using Sprout, Money.co.uk increased its social engagements 121.6%, garnering 5 million impressions and more than 26,000 link clicks in the process. Money.co.uk decided to take the leap into social media marketing in 2017, bringing on Social Media Specialist Thomas Davis in hopes of creating an engaged social community that would result in repeat site visits. Davis’ challenge? To build a thriving community from scratch. After testing different platforms, he determined Facebook provided the best ROI for the company in terms of engagement and website visits, making it the organization’s primary focus. All he needed was the right tool for the job. While Money.co.uk had used a different tool in the past, it hadn’t inspired much confidence. Sprout’s reporting functionality helped Davis convince his colleagues to make the switch. Reporting used to take me forever—going into each individual network, getting all the stats that I needed, putting them in a Google Doc. But now it takes me 20 minutes, and that’s made quite a big difference in time saved. It didn’t take long for Davis to build his workday around Sprout. Publishing and community management are essential parts of Money.co.uk’s social strategy, making features such as Sprout’s scheduler, Calendar and Smart Inbox a must. Consistent optimization based on Sprout data and analytics is also essential. Literally everything has grown. We’ve now got market-leading engagement, which is probably one of the things I’m proudest of. We’ve grown our networks massively. These time savings make a huge impact on Davis’ ability to tackle other work duties. 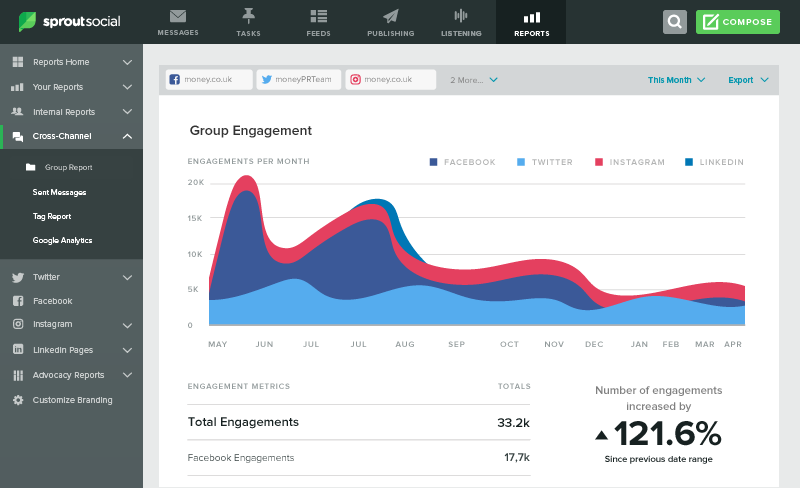 Sprout also enabled Money.co.uk to determine the best times for social engagement based on reporting data and when social conversations are taking place. And Davis can rest easy knowing he’s receiving Sprout’s award-winning support no matter which side of the pond he’s on. Davis’ mandate was growing brand awareness and creating a loyal social audience, making reach and engagement key metrics to track. Money.co.uk set out with clear objectives. With the help of a new social strategy supported by Sprout Social, it easily met them.